You can save time and money on airport parking at Birmingham International Airport (airport code BHM) with Birmingham Park, then Fly! There are four options for Birmingham airport parking. “AirValet” is a 24-hour, valet service car park, without shuttle service. It offers car care, as does “Alabama Airport Parking“, another valet service. 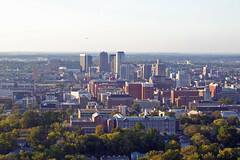 Near the interchange of I-20 and I-59, Birmingham International sits approximately 5 miles northeast of downtown Birmingham. This major airport has flights on American Airlines, Continental Airlines, Delta Air Lines, Delta Connection/Comair, Northwest Airlines, Southwest Airlines, United Express, US Airways and America West. Due to the presence of low cost carrier Southwest Airlines, the airport has started to pull away travelers from Atlanta’s airport. In addition to the business center with fax, a public notary and work stations, there is free wireless Internet available throughout the terminal. Food options include a half-dozen fast food restaurants and gift shop/bookstore. Near the north-south runway, visitors can also take in the The Southern Museum of Flight. For up-to-date traffic information, check out Alabama’s Department of Transportation here. Taxi: American Cab, Award Cab Company, Birmingham Cab Company, Hill Cab Company and Yellow Cab all service Birmingham International. Bus/Shuttle: Airport express runs to and from Atlanta’s airport to Birmingham’s airport. Birmingham Door to Door also provides shuttle service. Don’t fancy driving to the airport? Or leaving your car there and paying for parking? Catch a shuttle to Birmingham airport.